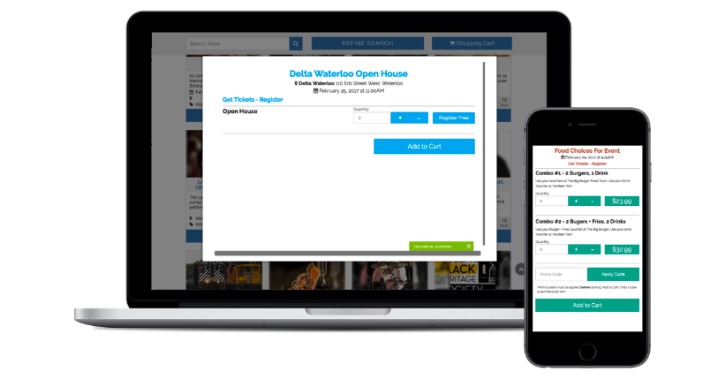 Whether for local attractions, restaurants or mega sized events, you can create and begin selling your online tickets, vouchers and gift certificates in minutes. You don’t need to be a computer wizard possessing coding skills to make it happen! We’ve created our ticketing and registration platform to be extremely user friendly for both the organizer as well as the purchaser. You’ll be able to create tickets, vouchers, passes, gift certificates, parking passes plus more in a very short period of time and begin sharing online immediately. Once signed in, whether a regular Eventastic user or one of our many Industry PRO License branded clients, you’ll click “Create” in the upper navbar to get started. 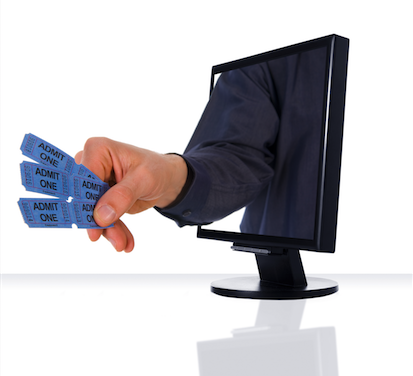 The ticketing or registration page that you’ll begin creating will act as a mini website or ‘Micro-Site’ of it’s own whereby it will be the vehicle to hold and carry your Ecommerce, ticketing, vouchers, passes and all related data. This page can be easily linked to your website for people to click a button and begin processing their orders or used as a stand alone where you’ll share the link to the page itself to notify people of what you’re offering. 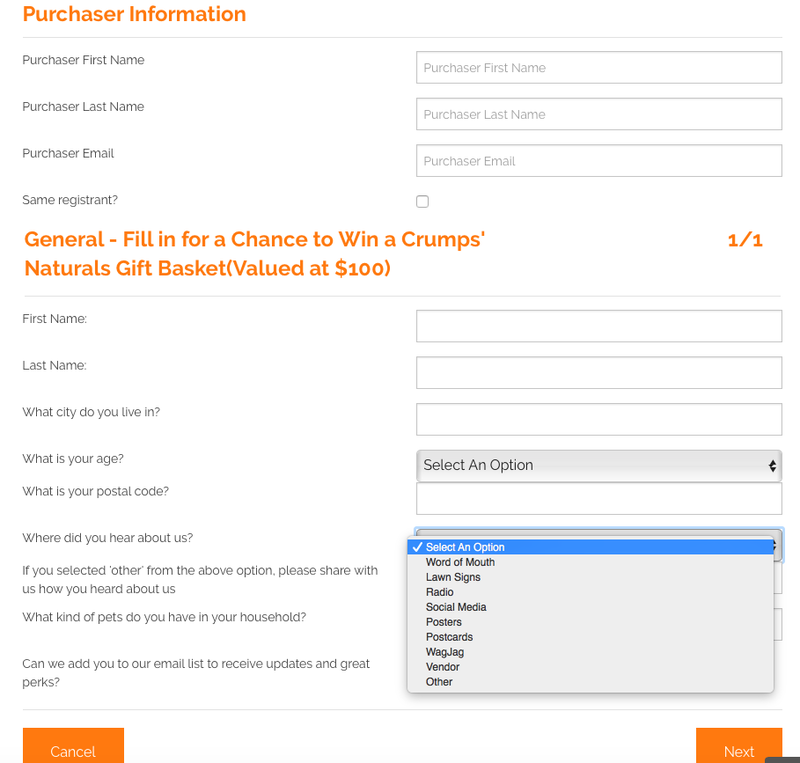 Once you click ‘Create’, enter the name you would like displayed on your page i.e. name of your event or title of your offering for the specified date and time. This name will not only act as the heading of your page but also be displayed under the key photo on your tickets. You’ll also be asked to choose a ‘Category’ and ‘Sub Category’ to refine search-ability for those pages set to be openly viewed by the general public. The categories chosen will also provide default photos to your ticketing/registration page which may be helpful but can be changed. ‘Let’s Go’ & Create Tickets Now! 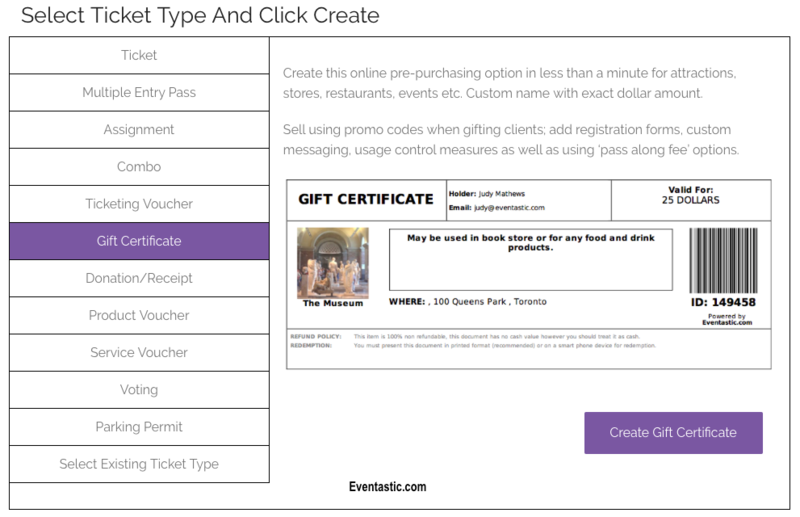 Once you click ‘Let’s Go’ you’ll be taken to your new ticketing or registration page displayed with purple edit buttons for each feature section allowing you to change and add such things as pictures, attachments, agenda, sponsor and donation buttons as well as detailed info as you want presented. Click the ‘Ticketing/Transaction’ button ‘On’ and you’ll be redirected to the Ticketing/Transaction Management page were you’ll have the option to choose the ticket type you want to create. 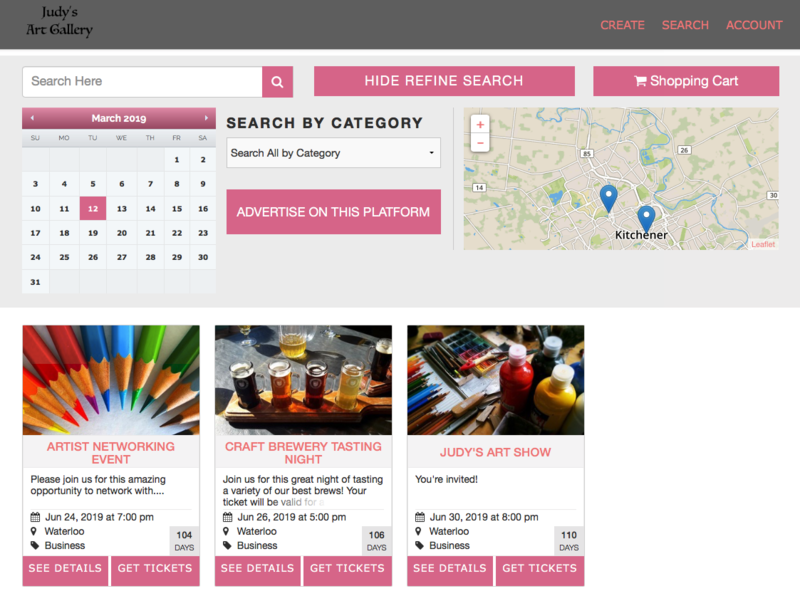 View the list of various ticket types on the left and as you click and select each type you’ll see a mockup of that ticket type displayed on the right as an example of what you can create. When you’ve selected your ticket type of choice then click the ‘Create’ button shown below the ticket example. Once clicked, your ticket template will open where you’ll add the name your ticket which will appear in the upper right corner of your ticket under the words “Valid For”. You’ll also add the price, a note to the purchaser inside the description box and indicate date/time the ticket will begin and stop selling. Note: if indicating your ticket will not start selling until a date in the future then this ticket will not appear when ‘previewing’ your page with tickets. This feature is perfect for time released tickets such as Early Bird tickets being sold prior to General Admission tickets. Note: Zero dollar tickets are displayed as ‘Register Free’ for those viewing your ticket selection. The title above your tickets is the wording you entered for your ‘Ticket Button Name Change’. See example below. Be aware of the small info tags beside various options when creating your ticket type as they will provide additional information regarding that option when you hover over them. Most people will click ‘yes’ to ‘Apply fees to the purchaser’ when creating their ticket type as this then makes it a fee free program for you. If you click ‘yes’ to ‘Would you like this ticket type to count against capacity?’, your ticket sales for this ticket you’re creating will not exceed the capacity number you entered in ‘The Details’ section of your page and provide you a running count of any tickets sold as ‘attendees’ in your page dashboard. Add promo codes and a registration form to this ticket as needed by simply clicking the respective buttons and following the prompts provided. Once your ticket is created to your liking, click ‘Save’ and this ticket will appear on your Ticket Management page. Every ticket type created will have a small square picture appear on the left side of the ticket. This picture is retrieved from the small square profile picture you add to your page to the left of the large square cover photo section. This can be a logo, a picture or whatever you see as being a key indicator for this event or offering. Once your ticket(s) have been created and saved you’ll be ready to share! 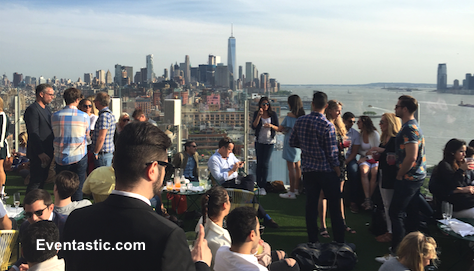 Click HERE to read our Top Tips To Sell More Tickets & Increase Registrations Online. See how easy it is to create your tickets by clicking here!